Not the rarest bike out there, but a British Classic none the less! A motorcycle from the 1950’s and one well worth keeping for the future. 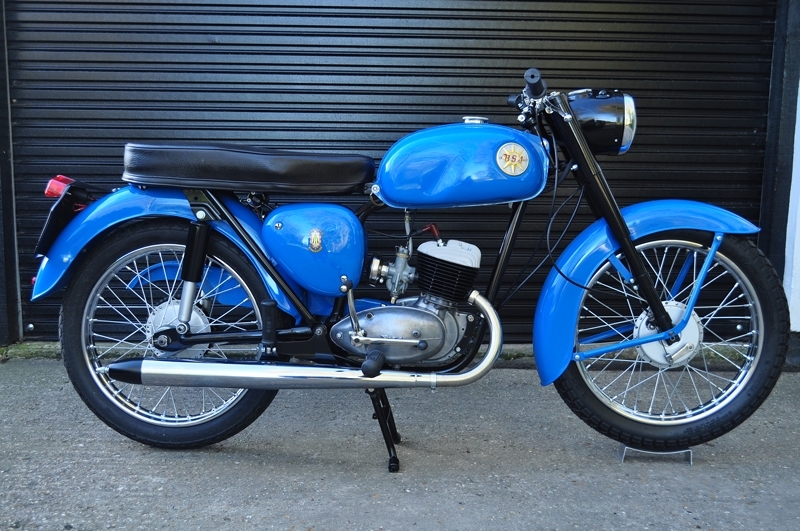 The BSA Bantam D7 175cc, re-finished in classic Sapphire Blue. This 1961 Bantam was brought to us 5 months ago from the last owner who had found it in a barn. Many parts were missing, but thanks to our suppliers, the parts were easily obtained, either new or re-furbished second hand to create this complete bike again. As with all our restorations, the bike was stripped to the frame and parts bagged for replacement or refurbishment. Over the months, each bag of parts is then cleaned, tested, replaced where necessary or refurbished back to near new condition until every part had been looked at. The engine was re-built and assembled with new gaskets. The wheel rims were replaced along with new spokes, retaining only the original hubs, the wheels were laced and trued in our own workshop. The bike is given a new paint job using the correct colours and the frame re-finished. Many of those hard to get parts were re-plated with chrome rather than sourcing pattern parts. We try to create a machine that is as correct as it would have been from the factory and the detail extends to our manufacture of a traditional wiring loom using sleeving rather than modern PVC, the correct paint colours and finishes, to trims such as bar grips, air filters and fuel filler caps. The machine is then re-assembled and tested and these pictures show the final result. Finally, the machine is given its first MOT for 17 years before being dated by the BSA owners club, then it’s off to the DVLA for an age related number plate. £2195 – Viewing always advised / Part Exchange Considered.